What causes an Ingrown Toenail? How did I get this Ingrowing Toenail? 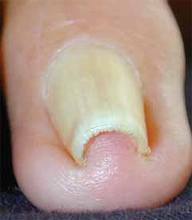 When we talk about an ingrown nail, we mean a toe that, to look at, looks obviously in trouble. It will be red, swollen, weeping, bloody and producing pus. There are several reasons you might have developed an infected toenail. Often, it is either a cutting error, trauma or a long-term shape problem. There is another nail complaint called onychophosis that is usually thought to be an ingrown nail by the public but is a different condition. Looking at it, all will appear to be normal. This is discussed in the Nail Shape section below. Trauma? This is much the same as above. Perhaps the trauma ripped the nail and left a shape edge. Otherwise, perhaps there was a single blow that pushed the intact nail edge (without a spike) to cut the skin. Often the trauma is not one single ‘big’ event but rather multiple small events such as the second toe pressing in on the nail of the big toe. In any case, the podiatrist will assess the cause and provide a solution to address the cause of the problem. Nail Shape? Sometimes the nail is curved excessively down into the nail groove at the side of the nail plate. In this case, one part of the nail will press into the skin much harder than elsewhere. This will cause a thickening of the skin there which amounts to a corn in the nail groove. These can be very painful ! 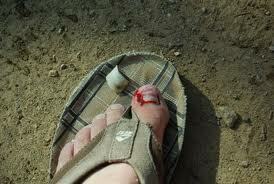 Likewise, pressure from a shoe or another toe can push thenail too hard and have the same result. It is usually necessary for the podiatrist to use a very fine tool to take away a slip of the nail and expose the corny area in the nail groove. This can then be cut out, again with a very fine tool. The process is generally painless. Relief is immediate. For more information, please browse to our printable Ingrown Toenail Info Sheet. Alternatively, use this link to return to the Podiatry FAQs Blog. Poor Cutting? When cutting nails down the side, frequently you won’t be able to see the extreme edge of the nail as it will be hidden beneath the flap of skin that bulges up beside the nail. As nails are brittle things, each time you cut one, the clippers start the cut with then usually finishes by the nail splitting through ahead of the clipper’s jaws. If you are lucky, this split runs to the edge of the nail fairly straight and nothing further happens. If the nail splits in a way that shortens almost all of the nail but leaves the very edge longer and pointy, you have a recipe for an ingrown toenail. If you had done what your Mum always said to and cut them straight across the top, this ‘spike’ will not be down in the skin fold and will be visibly poking out of the skin fold where it can’t cause much trouble. 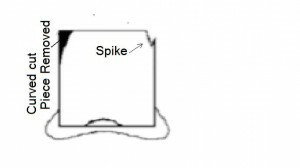 If you had the clippers pointing down into the fold, the spike will be hidden and the skin will be pressing in all around the jagged piece. All that needs to happen now is a tight shoe or a kick that forces the skin to be punctured onto the spike. Nail edges are dirty places and are always full of nasty bacteria from the large intestine (i.e. the bowel). A puncture here will always get infected. The skin then swells up, impaling itself still further onto the nail spike and getting into a worsening spiral. At this stage, antibiotics may dull the pain and reduce the overt infection but obviously this won’t remove the spike from inside the skin. As soon as the antibiotic effect finishes, the infection will swiftly return. In the medium term, the skin will try to grow new skin cells to close the hole. No matter how much skin you grow, the hole still exists because it has a nail shard in it, keeping it open. This proliferation of skin is called hypergranulation tissue and looks very bloody, almost like liver tissue. In the long term, this swollen skin may become permanent. See a podiatrist as early as possible to have the nail spike removed. A usual nail-cutting error (Right) and the pattern of nail that would be removed to solve the problem is shown reflected on the Left.